The Sunny Soups team are so proud to have hit a massive milestone: we have saved over a tonne of produce from the bin, turning it into the equivalent of 2,523 portions of soup. 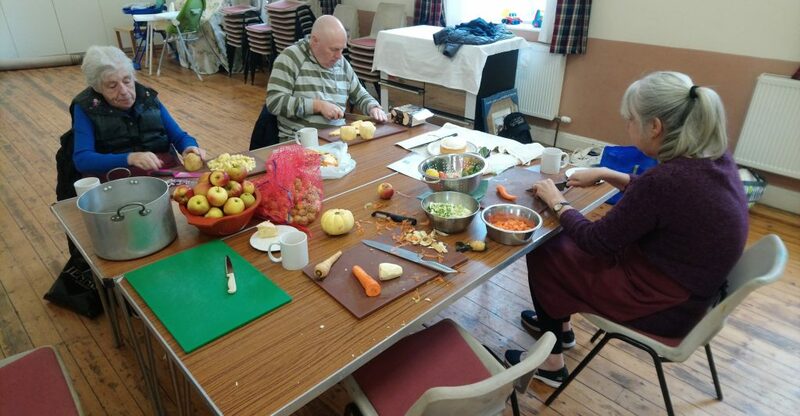 We make around 30 big pots of soups a week for our community freezer, relying on donations of surplus fruit and veg from our local independent greengrocer the Crunchy Carrot, from a wholesaler and sometimes from the local Co-operative and community or private gardens. We also use tins of beans and tomatoes occasionally donated by Dunbar Basics Food Bank. The quality of much of the produce that comes our way makes it even harder to believe that it could have gone in the bin. Last session we enjoyed slices of watermelon while we worked – donated as they had passed their sell-by date, but fresh, juicy and perfectly ripe still. We chopped up a box of bananas that had got a little cold so their skins were no longer perfect – they were unblemished inside, even a little under-ripe. It is so satisfying to put these delicious ingredients to good use, knowing they would otherwise have been discarded.